LOOKING FOR WAYS TO SAVE ON DRY CLEANING IN THE ROCHESTER, NY AREA? Check back monthly for our deal of the month. 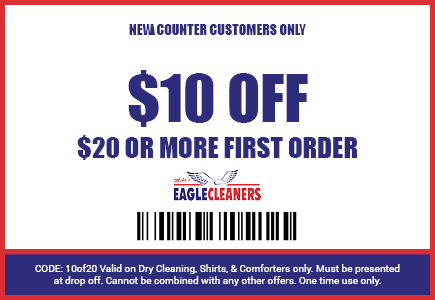 At Eagle Cleaners, we try to give back to our customers. We want nothing more than for you to be happy and satisfied with our dry cleaning services. So take advantage of our Monthly Specials and enjoy the great savings on dry cleaning! Click to print. DOWNLOAD OUR APP NOW FOR ADDITIONAL SAVINGS! Try our FREE Pick Up & Delivery service and redeem this special on your first order. Signing up is as easy as 1, 2, 3! 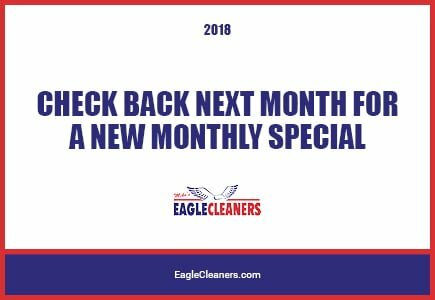 HAVEN’T TRIED EAGLE CLEANERS OR OUR DRY CLEANING SERVICES YET? Want to give us a try? Eagle Cleaners welcomes you with open arms! 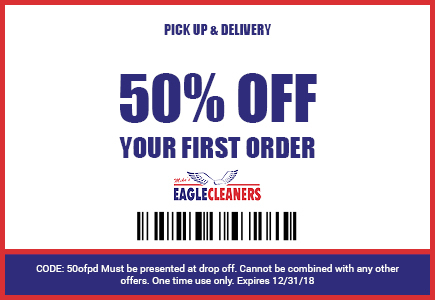 Stay in the loop with Eagle’s dry cleaning discounts and specials. Sign up to receive notifications and coupons. Never miss another deal again!